The 138th running of the Preakness Stakes at Pimlico Race Course on May 18, 2013 in Baltimore, Maryland. 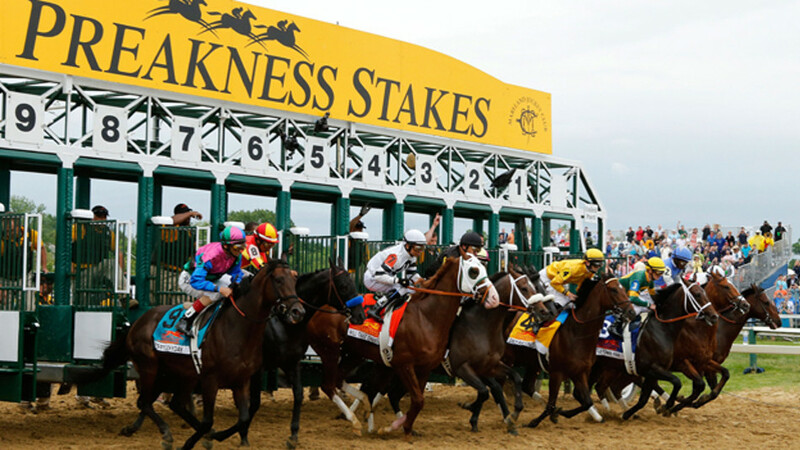 The Preakness is scheduled for tomorrow. 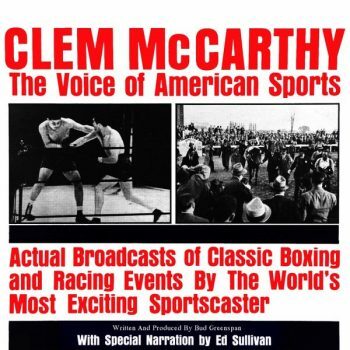 Contributor Barry Kipnis reminds us of what is likely the Triple Crown’s most famous (or infamous) broadcast call ever. The interesting and historic story is below. 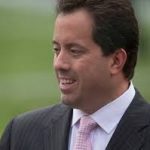 Kenny Albert’s best sport is hockey. 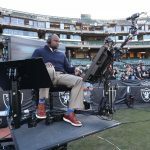 On TV, he gives viewers an occasional breather and provides his color commentators lots of runway. His passion for hockey started early. He was a kid when he followed his dad, Marv, to Madison Square Garden. 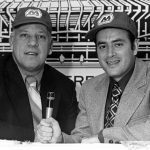 At the time, Marv was broadcasting Rangers’ games on radio. Through some quirky appeal when very young, Kenny fell in love with the Vancouver Canucks. Marv took a young Kenny on a dream trip to Vancouver to watch his favorite team live. It’s hard to believe. The younger Albert turned 50 this past February. 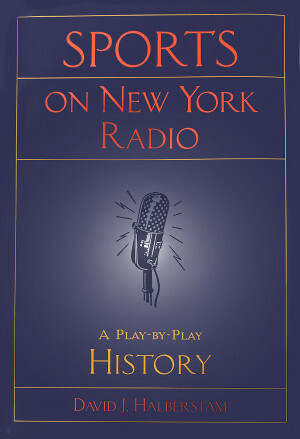 When Kenny was born, Marv was the sports director of WHN in New York (1050 on the dial). It makes me feel especially old because I recall Marv being congratulated on-air by one of the station’s music hosts for becoming a father. The 1050 frequency is now a foreign language programmed station. Basketball has had its share of broadcasters who have spewed inanities (e.g. color commentator Larry Conley on college ball, “I want you to watch the shooter. He steps behind the 3 point line and makes a beautiful shot”) or the late Steve Jones who did little more than maddeningly interrupt his play-by-play partner to say “10 on the shot-clock.” Goodness! What a world. 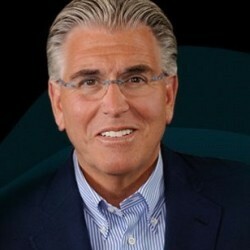 The unretirement of Mike Francesa dominated the New York tabloids recently. For the most past, the veteran Francesa was vilified by media critics and his own colleagues at WFAN for uprooting the trio who replaced him. Still, looking at the verbal spat from many miles away, WFAN and ESPN Radio in New York enjoyed weeks of center stage attention – at a time when radio revenue remains a challenge. Nothing like free publicity! On the entertaining Turner set, Shaq and Charles “Chuck” Barkley were engaged in uneasy exchanges. All these tiffs do is draw attention to the subjects’ programs. Interesting, ask most fans who the announcers are on Turner’s basketball coverage, they’re more likely to tell you Shaq, Kenny Smith and Barkley than Marv Albert, Reggie Miller and other venue assignees. Three of the NBA playoff announcers are 70 or over. 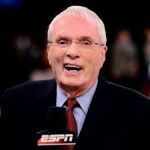 Hubie Brown leads the way. He’s 84, doing color and is still on the mark for ESPN/ABC. Marv Albert, 76, works for Turner and Mike Fratello, 71, for NBA TV. The late and beloved Voice of the Wildcats would build his power to ad-lib by attending speeches of the renowned. Cawood would sit in the back and take notes. There was no more popular figure in the state than Ledford. He called Kentucky games starting in 1953. His last season was 1991-1992 when Duke and Christian Laettner beat Kentucky in the regional final. After the game, Duke Coach Mike Krzyzewski went over to where Ledford was sitting at courtside and congratulated him for his 39 years as the Wildcats’ popular voice. Now that the baseball season is in full swing, how can we not think of the great Vin Scully regularly? If I was teaching a broadcast course at a college, I would make all budding announcers memorize Vin’s top of the ninth call of Sandy Koufax’ 1965 perfect game against the Chicago Cubs. Scully had it all; perfect terminology, never a hitch in his call, command of the language, colorful description, impeccable pausing, subtle interpretations, proper framing and a mellifluous voice. No better lesson for broadcasters. Through it all, Vin never raised his voice. Broadcasters of the last generation like Jack Buck, Mel Allen, Jack Brickhouse and others said they would learn from broadcast pioneer Ted Husing, studying each of his words; pronunciation, use of voice, punctuation and cadence. 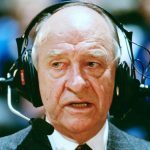 In the 30s and 40s, Husing was as well known across the country as any network sportscaster you can mention today. Jack Armstrong does color on Raptors’ radio broadcasts. With the announcers so high off the floor, post game interviews are done from a distance while players are out of view, often downstairs near the locker room. The longtime voice of the Hurricanes was around during the first iteration of Miami basketball before the program was dropped in 1971. (It was restarted in 1985.) Yes, when Rick Barry was the Canes’ star in the 60s. In those years, Miami wouldn’t frequently travel the announcers. Road games were at times recreated through information fed by telephone or off a ticker. 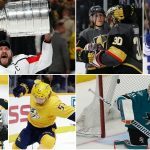 Hirsch said that when he would lose his connection with the venue, he would buy time by the telling the audience that one of the players lost his contact lens and they’re combing the floor to try to find it. In a recent column, I listed broadcasters who tragically died on the job, in their boots so to speak. I neglected to mention two noted names. 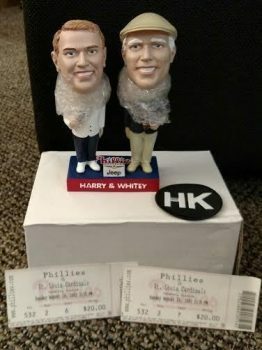 Richie Ashburn, the popular Phils’ announcer, died of a heart attack in Manhattan prior to a Mets game at Shea Stadium in 1997. He was 70. Arch McDonald, longtime voice of the Redskins and Senators, died on a train, returning to D.C. from a Redskins-Giants’ broadcast in New York in 1960. He was only 59. McDonald was the first voice of the New York Yankees and New York baseball Giants in 1939 when the three New York teams finally ended their radio bans. (During the ’39 season, the Giants and Yankees had a combined package, essentially of home games.) Arch lasted only one year before returning to D.C. Mel Allen joined Arch in mid-season, 1939. Mel was summoned after McDonald’s first partner, Garnett Marks, was fired six weeks into the season. Ivory Soap was the sponsor of the broadcasts and twice Marks called Ivory Soap, Ovary Soap. That was it. He was gone. That’s how Mel Allen’s illustrious Yankees career began. Allen was in the booth from 1939-64. Sean Kelly, radio voice of the New Orleans Pelicans, is also a firefighter for the St. Tammany Fire District, about 40 miles from the arena. He’s missed broadcasts because of this community commitment. Sean has his priorities in order. Saving lives comes first! 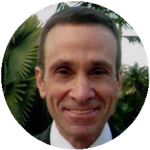 Kelly’s television colleague, Joel Meyers, burning both ends of the candle, was one of the Lakers’ voices on January 22, 2006 when Kobe Bryant exploded for 81 points against Toronto. But Meyers was off on another assignment, doing Sunday Night Football for Westwood One . That’s risky business. At some point later, Meyers lost both gigs. He did wind up in New Orleans in 2012. Tom Hammond who unflappably anchored NBC’s horse racing coverage for many years majored, accordingly, in zoology at the University of Kentucky. So did long time CBS hockey, horse racing and boxing announcer, Win Elliot. He attended the University of Michigan. In 1947, American television was new and hardly available. 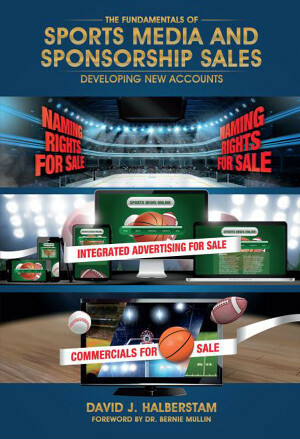 Network radio was still the indispensable source for coverage of live national sports and news. Like boxing in those years, horse racing was as popular as the NFL is today. Through the last half century, other than the Triple Crown and an occasional brawl in the ring, horse racing and boxing have faded off sports fans’ radars. Not then. The ponies were a constant subject of conversation. Clem McCarthy (1882-1962), one of the all-time broadcast greats, called the 1947 Preakness but his call that day erred terribly! McCarthy proclaimed Jet Pilot the winner when Faultless crossed the finish line first. Millions of listeners who placed a couple shekels on the big race, were startled. But the instant McCarthy realized his mistake, he humbly corrected himself and apologized profusely. Still, McCarthy, 64 at the time, suffered a groundswell of criticism, particularly from envious colleagues. casters, Bill Stern and Harry Wismer, had a penchant for reporting “imaginary laterals” when they had the wrong players sprinting toward the end zone for a touchdown. For instance, Wismer once had Army’s Glenn Davis with the ball instead of Doc Blanchard, so he conveniently reported an “imaginary lateral” toward the end of the run. (“Davis gives it to Blanchard who scores.”) The very visible Stern was especially known for this chicanery. Before television, there was also less ac countability. Decades later, the acclaimed Olympics’ filmmaker, Bud Greenspan, wrote a piece for the Los Angeles Times (5/13/1987-How Clem McCarthy called the wrong winner of the Preakness), detailing what went wrong; how the master McCarthy misidentified the winner Faultless, for Jet Pilot.